Back in late March when I learned that Jinn & Tonic is a finalist in RWA’s Golden Heart contest, the conference in mid-July was a long way off. Suddenly it’s next week, and I’m not ready. I’ve decided how much cash to take, based on what I spent in New York City and Anaheim (thank you, Quicken), but I haven’t been to the bank yet. I’ve registered (and paid) for the conference and for two events sponsored by on-line chapters that I belong to, the Golden Network Retreat and the Fantasy, Futuristic and Paranormal Chapter Gathering. I’ve sent RSVPs for a couple of party invitations. I have my airline and hotel reservations. 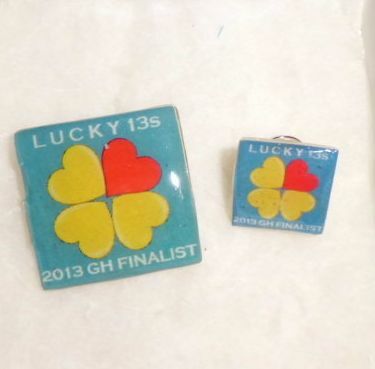 A couple of weeks ago I opened my mailbox and found the Lucky 13 Golden Heart pins designed and made by one of our number, who writes historical romance as Eliss Baker and designs jewelry as Lisa Confetti. The smaller one will go on my conference badge holder, along with my Golden Heart pins and my Starcatcher (2011) and Firebird (2012) pins. Badge bling is a fun part of the conference. Plans for the conference–workshops, receptions, appointments, dinners–are filling up a spreadsheet on my computer. I’ll print that out, and probable scribble on it, because I’m not taking a laptop with me (I don’t even own one). I know some of my friends are building schedules on their smart phones. My phone is only moderately intelligent, and I’m still trying to learn how to access my email on it. I’ll be using paper schedules and a spiral bound notebook. My email inbox is overflowing with chatter from friends making plans to meet for dinner or drinks, information on the local restaurants, attractions, and transportation in Atlanta, and I’m afraid to clean it out for fear of losing some essential bit of information not yet transferred to my spreadsheet. Meanwhile, I’m compiling a mental list of all the things I’m putting off until I get back (get the car serviced, have the roof inspected, make an appointment with the eye doctor . . . ). I probably should put that list on paper, or at least in a computer file. I’m frazzled, and semi-organized at best, but I’m also looking forward to Atlanta. This will be my third RWA conference in three years. I can’t wait to see old friends and new. Atlanta, here we come. Same here, Kristin. I’m not doing much better tonight, trying to fill in the agenda for a chapter meeting on Saturday. Can’t wait to get on the plane Tuesday–and relax. I’ve spent more time messing with SWAG than anything else. Erin Knightley inspired me with her packing video. http://www.youtube.com/watch?feature=player_embedded&v=zDdv91mcAi0 But I’m too chicken to try a 22 inch bag. Yes, I put all the events in my phone. Now all I have to do is add the workshop rooms when I get the conference brochure. I’m trying to decide whether to take an extra bag or not, Vicky–I know I’ll just bring it back full of books. Thanks for the pic of the pins. Looking forward to getting mine! I have so many things on my schedule at this point, I don’t know if I’ll make it to many workshops. As for packing–haven’t a clue what I’m taking aside from my awards event get-up. Hopefully it’ll all come together on Sunday and I won’t forget anything important. Hi, Lark. Workshops? Oh, yeah, workshops. They’re popping up here and there on my spreadsheet, but I seem to be spending more time trying to figure out who to meet for dinner. Hi, Jacqui. I’m so looking forward to meeting you, too, and all the Lucky 13s. It’s going to be a blast. Great job, Kay, on summing up the last days before conference for al us. Everyone is scrambling to get ready now that conference is just a few days away. Where did the time go? It’s like a roller coaster ride that starts off with the announcements in March then picking up speed sling the way, from fun to super-fun and a little bit scary. Looking forward to meeting all of the finalists next week. It really is a roller coast, Jacqueline, but we have good friends to share the thrills.